 Buellton, Santa Barbara County: A.J. Spurs, 350 E. Highway 246. Windmill Days Inn and Clubhouse Sports Bar, 114 E. Highway 246. Hitching Post II, 406 E. Highway 246. Ostrich Land, 610 E. Highway 246. Sanford Winery, 7250 Santa Rosa Road. The car crash was off of Jonata Park Road and Avenue of the Flags, on the west side of the street near the Buellton Self Storage.  Brentwood, Los Angeles, Los Angeles County.  Gaviota, Santa Barbara County: Gaviota State Beach, Highway 101.  Goleta, Santa Barbara County: Miles' San Diego apartment was actually filmed in Goleta.  Lompoc, Santa Barbara County: Santa Rosa Road. Lompoc Farmers' Market, W. Ocean Avenue and S. I Street. Ocean Lanes Bowling, 1420 E. Ocean Avenue. Cabrillo High School, 4350 Constellation Road, Vandenberg Village.  Los Olivos, Santa Barbara County: Andrew Murray Vineyards. The "Frass Canyon Winery" was really the Fess Parker Winery, 6200 Foxen Canyon Road. Firestone Winery, 5000 Zaca Station Road. Los Olivos Cafe and Wine Merchant, 2879 Grand Avenue.  Montebello, Los Angeles County: The wedding / parking lot scene at the end was filmed at Holy Cross Armenian Church, 900 W. Lincoln Avenue at N. Montebello Boulevard.  San Diego, San Diego County: Hawthorn Street onramp to Hwy 5 north.  Santa Maria, Santa Barbara County: Foxen Winery, 7200 Foxen Canyon Road. Though set in Oxnard, Miles' mom's apartment was actually filmed in Santa Maria.  Santa Ynez, Santa Barbara County: Kalyra Winery, 343 N. Refugio Road.  Solvang, Santa Barbara County: River Course at The Alisal Guest Ranch Golf Course, 150 Alisal Road. Solvang Restaurant, 1672 Copenhagen Drive.  "Filmmaking Great For Tourism"  The Desert Sun, 17 December 2004. 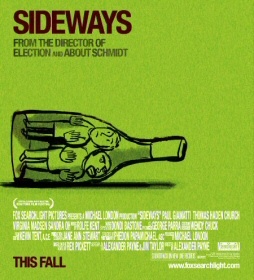  "Wineries Bask in their 'Sideways' Cameos"  MSNBC, 20 January 2005.  "Wine Critic... Explains How to Retrace..."  San Jose Mercury News, 23 January 2005.  "Using 'Sideways' to Get Ahead"  The Lompoc Record, 27 January 2005.  "Hollywood and Vines"  Los Angeles Times, 30 January 2005.  "A 'Sideways' Tour of Santa Barbara County"  The Tribune, 31 January 2005.  "Slipping Sideways"  Time Magazine, 31 January 2005.  "Visitors Are Flocking to Wine Country"  Wall Street Journal, 17 February 2005.